We were savvy enough to know that we should agree the price for the journey in advance so we hailed our first Tuk Tuk driver and duly started negotiating. We weren’t going to be taken for mugs and we knew the price in Baht for the journey shouldn’t work out at much more than about £1. We weren't surprised to be offered some outrageous prices but - with a long line of drivers willing to haggle for our business - we merrily dismissed driver after driver as we waited for one to accept a reasonable price. Eventually we persuaded a driver to accept our £1 and take us to the hotel. At the end of the journey he pleaded with us for a decent tip, explaining passionately that he had a wife and kids to feed and we really were paying too little for the journey. By this stage, brimming with confidence in our negotiation skills, confident we had paid a healthy full fare and determined not to be taken as a pair of fools at the last hurdle, we airily waved him away and retired to the hotel bar. Here’s the rub: the following morning we realised that - having been through several currency changes in the preceding days - we had completely messed up our exchange rate calculations. What we had thought was £1 was in fact only 10p. Apart from the obvious lesson about supply and demand - there was an over-supply of Tuk Tuks which placed us in a very strong negotiating position - this experience taught me something that has served me well in negotiations ever since. We were being unreasonable in our negotiations but because we believed we were being reasonable we stuck by our guns. If we had known the correct exchange rate - if we'd been reasonable negotiators - we'd have struck a far worse deal. Note: It's been pointed out that I and my colleague were being dicks in this scenario. I kind of assumed that was obvious but if it needs stating then yes, we were being dicks. Bear that in mind as you follow this analogy through. I'm reminded of this experience as the increasingly public and fraught fiscal framework negotiations between the UK and Scottish governments drag on. It's clear that agreeing what's reasonable - what satisfies the condition of "taxpayer fairness" while still honouring the Smith Agreement - is the source of the impasse. The crux of the matter in my view is this: the Scottish Government are not being reasonable, which is a completely appropriate negotiating position to take to get the best deal for Scotland. If you're not familiar with the background on the Smith Agreement and the dynamics of the Barnett Formula now might be a good time to read my last blog post (Barnett Fair? ); from here on I'll take an understanding of these issues as read. Both parties agree that a Block Grant will remain and it will be reduced by an appropriate amount on day one to ensure that the first "no detriment" principle is met. The Block Grant's year-on-year changes will continue to be calculated according to the Barnett Formula which ensures another key principle of Smith is delivered: the Barnett Formula remains. Quite simply: the Smith Commission left this indexing open to negotiation and the only guidance given was that there should be an "appropriate" index and that it should be "fair" to both parties. So, recognising that this is not the same as being wrong in their approach to negotiation, it does appear that the SNP are being unreasonable. The "no detriment" principle was specified clearly enough for it to be pretty clearly unreasonable to claim that it's fair to apply it to indexing of the Block Grant Adjustment. Again: "no detriment" was specifically defined to apply to the impact of "initial transfer" (i.e. day one) and "policy decisions that affect the tax or expenditure of the other". There was nothing to suggest that shifting the mix of revenue from Barnett indexed to retention and control of own taxes should in itself be designed so as to ensure "no detriment". Indeed it could be argued that the whole point of devolving greater control and responsibility is to make us more exposed to and aware of the impacts of our particular demographic challenges. 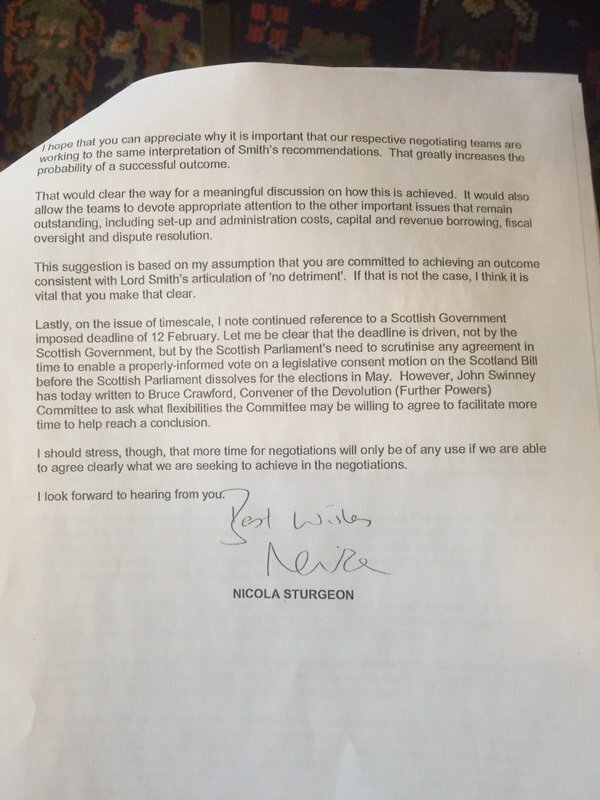 The SNP's negotiating position is unreasonable - they are attempting to appropriate the "no detriment" clause and apply it in a way it was never intended to apply. The SNP's negotiating position is hypocritical - they are arguing to retain some of the benefits of pooling and sharing that they've spent their political lives claiming are non-existent. Of course the SNP can't lose here. If no agreement is reached they can unreasonably (but credibly) accuse the UK Government of reneging on the Smith Agreement; if they succeed in getting an unreasonable deal it will be in Scotland's best interests - so they'll be applauded for negotiating the 10p Tuk Tuk ride. Nobody said life had to be fair. 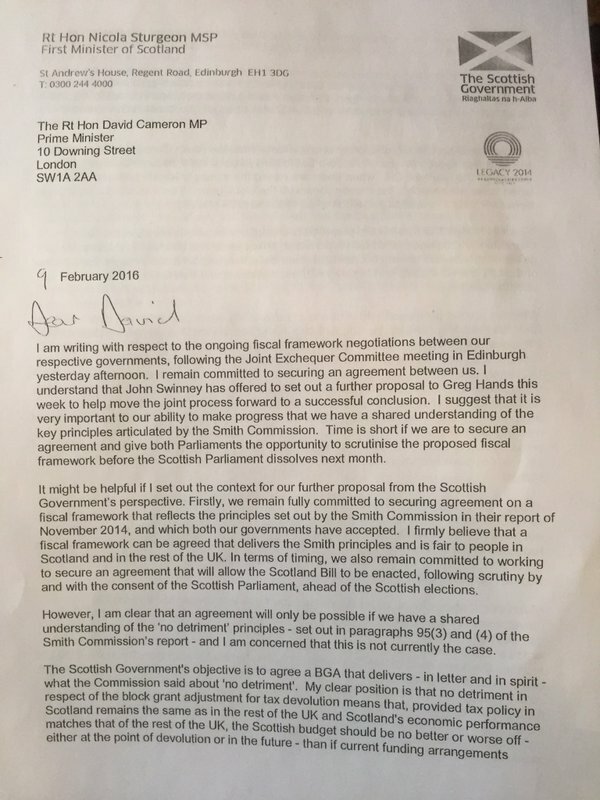 During a brief appearance on BBC's Scotland 2016 last night I was asked about Nicola Sturgeon's letter to David Cameron (full version below) in which she highlighted the importance of the interpretation of the Smith Commission's "no detriment" clause in relation to the ongoing Fiscal Framework negotiations. With the benefit of the breathing space that this blog allows, forgive me while I let my belt out a notch and try to present a slightly more complete answer. The key question here is: how do we interpret the Smith Commission's "no detriment" clause? 95 (3): No detriment as the result of the decision to devolve further power; the Scottish and UK Governments' budgets should be no larger or smaller simply as a result of the initial transfer of tax and/or spending powers, before considering how these are used. (b) Changes to taxes in the rest of the UK, for which responsibility in Scotland has been devolved. should only affect public spending in the rest of the UK. Changes to devolved taxes in Scotland should only affect public spending in Scotland. 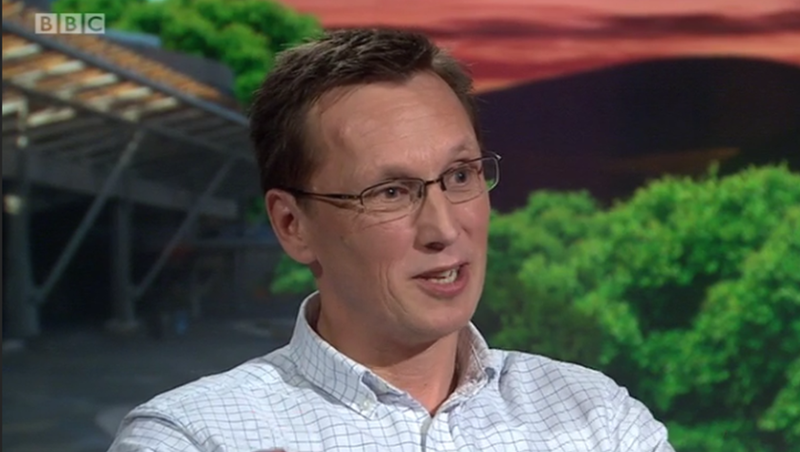 So there are in fact two "no detriment" clauses in Smith. 95(3) is very straightforward. If control over a tax that currently generates £1bn of revenue is transferred (and therefore Scotland gets to keep that revenue directly) then the block grant is reduced by £1bn at the same time; there is no detriment on the initial transfer1. It's worth noting that if this "no detriment" principle was followed to allow all tax raising powers to be transferred to Scotland then there would still be a rump of block grant left at the end of about £8bn (because the "no detriment" approach protects the value of Barnett under current tax raising circumstances2). Readers of Chokkablog will be very familiar with this figure; if you're not please read "What's £8bn Between Friends"
95(4) is conceptually simple but could be hugely complicated in practice. "... whilst "more powers" is a superficially attractive concept, the devil as always is in the detail. "More powers" could - if not carefully calibrated - lead to the dismantling of the very benefits of Union that the Scottish people voted so overwhelmingly in favour of retaining." But we are where we are. The Smith Commission agreement has to be honoured and the issues above should be resolvable by pragmatic political negotiation. As we'll come on to see; it's not as if the existing Barnett arrangement is flawless4. 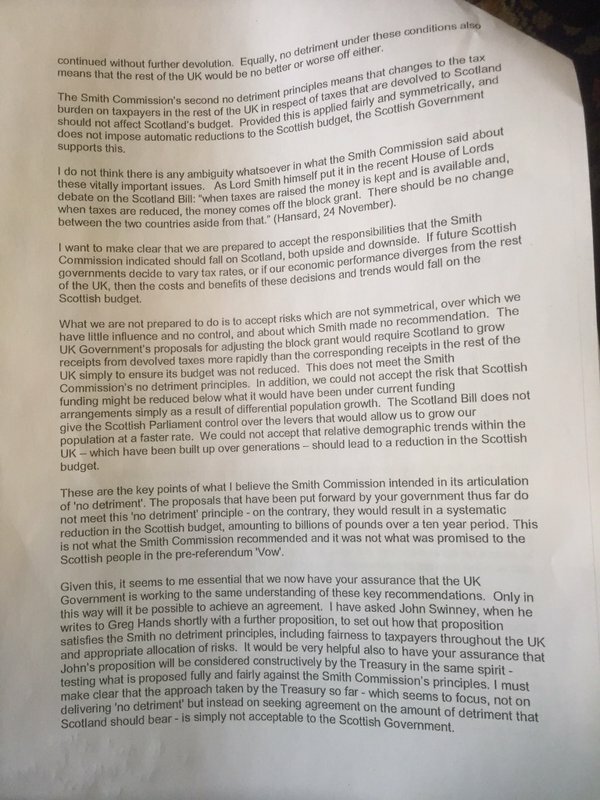 "we are not about to accept risks [...] about which Smith made no recommendation"
"The UK government's proposals for adjusting the block grant would require Scotland to grow receipts from devolved taxes more rapidly than the corresponding receipts in the rest of the UK simply to ensure its budget is not reduced. This does not meet the Smith Commission's no detriment principles. So what's going on here, why would "relative demographic trends" lead to a reduction in the Scottish budget and is it reasonable to "not accept" exposure to this effect? ... which means Scotland's per capita spend must rise (spend has gone up, population hasn't) even though the UK's hasn't. Good old Barnett. So the problem for Sturgeon - the problem for Scotland - is that by devolving powers we inevitably shift some money away from being indexed to UK spend and towards being directly dependent on our (population's) actual tax revenue generation. Because our population growth is slower that means we lose out compared to the alternative of not devolving the powers and maintaining Barnett. It seems to me that it was never the intention of the Smith Commission to have "no detriment" applying to "compared to the alternative of not devolving the powers", but by trying to retain this rather perverse Barnett effect that is what the SNP are arguing for. "it is impossible to design a block grant adjustment system that satisfies the spirit of the ‘no detriment from the decision to devolve’ principle at the same time as fully achieving the ‘taxpayer fairness’ principle: at least while the Barnett Formula remains in place." For what it's worth I think the IFS reach this "impossible" conclusion because they are applying a broader interpretation of "no detriment" than that intended by Smith. It seems clear to me that the specific demographic trend benefits of the Barnett Formula can only be retained in proportion to the block grant. A proportion of the currently "locked in" benefit of Barnett must surely be sacrificed in return for transferring funds out of the block grant when devolving control/retention of more taxes. The problem here is that the Barnett Formula is - under current demographic trends - objectively unfair to the rest of the UK. It's therefore impossible to find a fair solution that both gives Scotland the upside of replacing Barnett money with direct control/retention of more of our own taxes whilst at the same time keeping the protection from demographic trends that Barnett affords us. The fiscal framework negotiation are simply highlighting the inherent unfairness in the way an unchanged Barnett would work in Scotland's favour if no further powers were devolved. More broadly, these negotiations highlight the fact that with devolved power comes devolved responsibility. Part of that devolved responsibility means being more directly affected by Scotland's particular demographic challenges. I fear that in their summit-fever rush for more powers the SNP made the mistake of believing their own grievance-rousing rhetoric about how badly the Union treats Scotland. The next few days of negotiation are critical: we're about to find out how high a price we're going to pay for the SNP's intemperate haste to seize more powers and weaken the bonds of Union. It's meaningless isn't it? Just a big scary number that's bandied about among other big scary numbers. Except this particular big scary number (allowing for a bit of rounding here and there) is central to the ongoing Scottish constitutional debate. Let's start with some historical actual figures. This blog has shown that - using the Scottish Government's own GERS figures and applying a range of possible methodologies - the onshore deficit gap between Scotland and the UK has historically consistently been between £8bn and £9bn. It's worth being clear about what this number means: it's a measure (pro-rata on either population or GDP) showing how much worse Scotland's deficit would have been than that we share with the rest of the UK if we hadn't had North Sea oil. This onshore deficit gap matters because it is revealed - it becomes real - as oil revenues decline. This is not to say that were Scotland to be independent this gap would remain; it might narrow, it might widen. It merely gives us an idea of the run-rate relative disadvantage we would be starting with if we sacrificed the benefits of UK-wide pooling and sharing (assuming the days of significant oil revenues are indeed behind us). If you like, it's the head-start we'd be giving to the rest of the UK. For the avoidance of doubt: this is not Scotland's deficit without oil & gas; it is how much worse than our shared UK deficit Scotland's deficit would be without oil and gas. 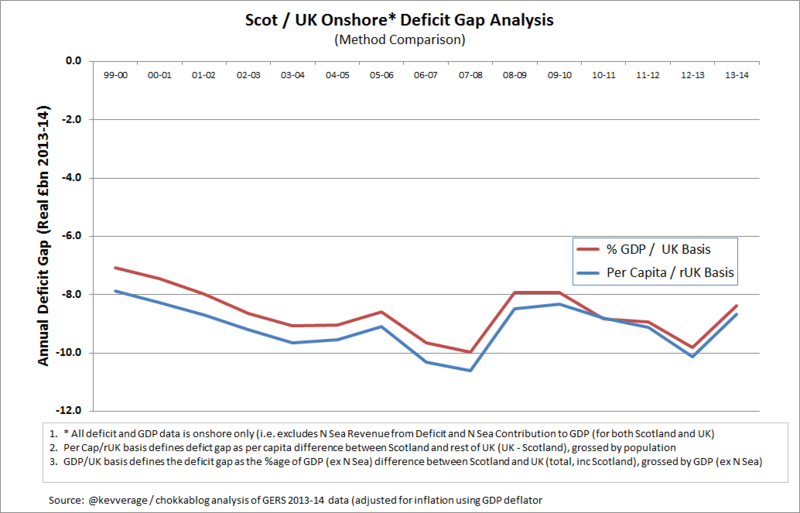 So GERS figures show we've historically run an onshore deficit gap versus the UK of over £8bn pa. When the IFS analysed the projected fiscal gap between Scotland and the UK they concluded that there would be a gap of £7.6bn in 2015-16. At that time they were assuming £0.6bn of oil revenue, so without oil revenue that shows an onshore deficit gap of £8.2bn. So the IFS projected our onshore deficit gap versus the UK for 2015-16 would remain around £8bn pa. The NIESR recently analysed the difference between the Scottish and UK economies using the generational accounting method (which among other factors models the net fiscal implications of different population age profiles over time). The NIESR used the latest OBR assumptions for oil & gas revenues, which in this context are effectively zero (£0.1 - 0.3bn pa. in coming years). Their conclusion was that in the long-term a fiscal gap exists of £9.5bn to £10.7bn pa. So the NIESR highlighted structural reasons why the deficit gap between Scotland and the UK would widen over time to well over £8bn pa. The Barnett Formula is the mechanism that currently allows Scotland to benefit from higher public spending per capita than the UK as a whole. It involves notoriously complex calculations and is increasingly complicated by increased devolution of revenue raising powers ... but if we want a simple indication of "what's Barnett worth to Scotland" we need only look at how much greater public public spending per capita Scotland receives than the rest of the UK. In the most recent available GERS figures Scotland received 11.6% higher expenditure per capita than the rest of the UK (table 5.7); in cash terms that works out at £7.7bn. So the Barnett formula currently benefits Scotland to the tune of about £8bn pa. The fact that this £8bn figure keeps recurring is not coincidental. The Barnett formula predates the 80's oil boom which is why it protects our public spending when oil revenues decline. It's worth c.£8bn to us because it fills the onshore deficit gap; that onshore deficit gap is largely caused by the higher spending that Barnett enables. So hopefully it's becoming clear that this £8bn figure is central to the debate around independence (or indeed Full Fiscal Autonomy). Again: it's not how big our deficit would be; it's how much bigger our deficit would be (than the one we currently share with the rest of the UK) if oil revenues go and if we lose the Barnett formula delivered benefits of UK-wide pooling & sharing. But of course it's only how much worse off we'd be if all else remained the same - if all else remained the same, what would be the point of independence? I don't want to retread the well-worn path of why independence might in fact make things relatively worse (minor issues like what currency we'd use and within what fiscal constraints, business and capital flight etc.) or why some of the claims for why things might get better are - how can I put this? - somewhat less than logically compelling. Instead let's simply look at the White Paper: "Scotland's Future: your guide to an independent Scotland" and consider how that dealt with the £8bn problem. This 649 page document found room for just the one page of financial projections: an estimate of Scotland's financial position in 2016/17 "under current constitutional arrangements" (page 75). The figures used were basically a merging of GERS figures and OBR projections with a few choice adjustments. Imagine putting this page together and having to defend these numbers. You want to be able to say "oil is just a bonus" but without admitting that without oil you've got an £8bn gap to fill. The best you can cobble together through assumptions about "savings or increases in revenues" is £0.6bn a year (p.78). To get to this figure you've played your defence and security spending joker (the Trident card), you've had to accept that GERS figures already exclude expenditure that the Scottish Government judges we don't get any benefit from (Olympics, Crossrail, London Sewers etc.) and you've made some heroically optimistic assumptions about the costs that will be required to replace the administrative functions currently shared with the rest of the UK. And yet you've hardly dented the £8bn. So you're back looking at oil. You've largely relied on the OBR for forecast figures (see White Paper notes 42 and 43) but they're forecasting only around £3bn for offshore receipts. So what do you do? You ignore the OBR oil forecasts and bung in assumptions for offshore revenue that range from £6.8bn to £7.9bn pa. So the White Paper solved the £8bn problem by assuming oil revenues of up to c.£8bn. 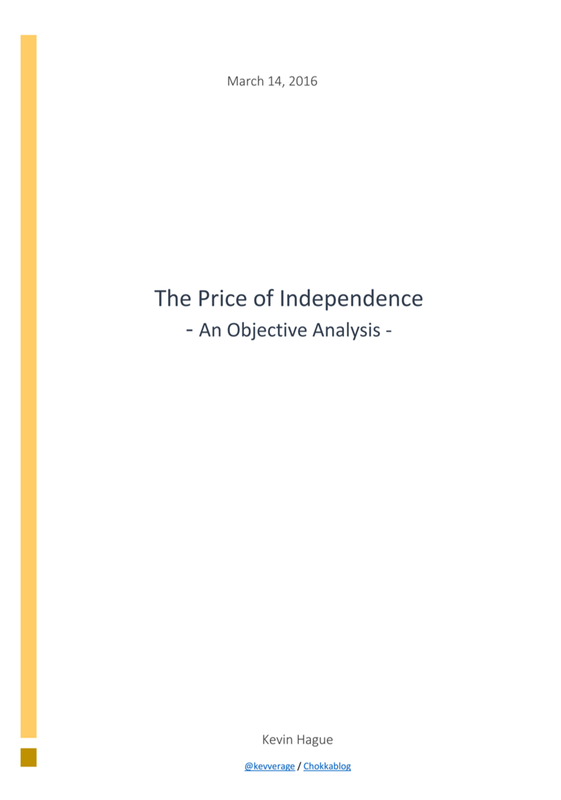 Anybody who doubts that the "oil is just a bonus" claims were rhetorical nonsense need look no further than the White Paper itself: if oil was just a bonus, why did the economic case for independence rely on it? Of course some will argue that the existence of the £8bn onshore gap is somehow proof of the fact the the UK is failing Scotland. This overlooks the blindingly obvious fact that this gap is a result of higher public spending in Scotland far more than it is lower onshore tax generation (a topic covered in depth in the blog post FFA for Dummies). So this £8bn figure really matters - and with the OBR now expecting oil revenues to be around £0.1bn - £0.3bn pa. it's a number that isn't going away anytime soon. Scottish Tax Payers pay £11bn income tax on £68.7bn of income: so to raise £8bn through income tax alone would require an additional 11.6% on everybody's income tax rates (or for those who prefer to present it this way: a 73% increase in our total national income tax bill). Our onshore GDP in 2013-14 was £135bn (£153bn including oil): so if we wanted to just carry that £8bn as higher deficit this alone would account for an additional deficit of 5.9% of GDP (that's in addition to any underlying deficit we would have by tracking the rest of the UK). To put that figure in context, the EU stability and growth pact sets a total deficit target of less than 3% of GDP. Given the attacks of the vapors suffered by SNP MSPS's at Labour's suggestion that we might offset "Tory cuts" by raising a mere £0.5bn through income tax, you have to wonder how on earth they would have coped with the prospect of plugging the £8bn fiscal gap a Yes vote vote would have left us facing. Fortunately we voted No and can reasonably argue that £8bn pa. isn't that much between friends ... when our friends are 10 times our size and we shared "our" oil revenues with them in the boom years. But if we continue to indulge in the politics of unjustified grievance, we might end up losing our friends and finding out the hard way quite how big a deal £8bn is. A remarkable thing just happened. With one bold policy announcement Scottish Labour have given voters a chance to vote for an alternative to Tory austerity, a chance to vote to actually use the powers that Holyrood has, a chance to choose an alternative to four more years of just bitching about Westminster. They are suggesting that we actually use the Scottish Rate of Income Tax to apply a small, progressive tax increase as an alternative to cutting public spending. 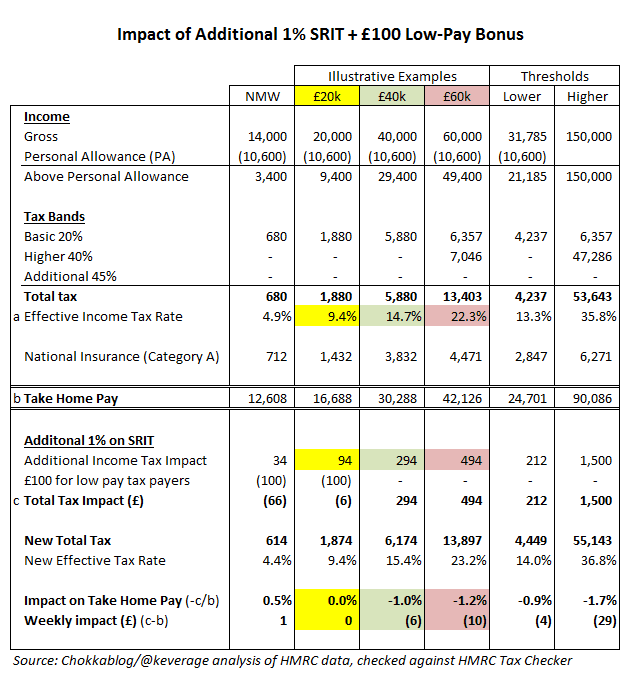 Followers of Chokkablog will be aware that - despite John Swinney's previous assertions to the contrary - the simple act of increasing the Scottish Rate of Income Tax (SRIT) would be a progressive move. 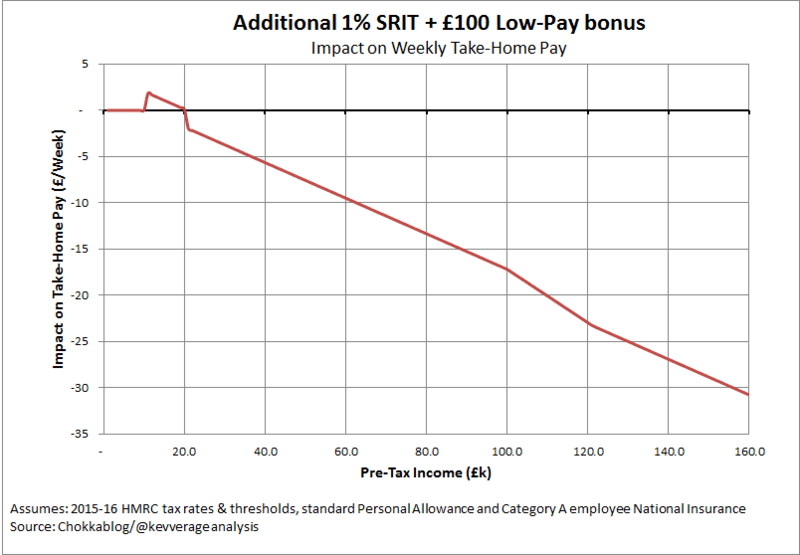 Tax free allowances mean that the more you get paid, the higher the proportion of your income that is taxed - so a "flat" increase of 1% on all tax bands hits the higher paid proportionately more. If you still need convincing, please read SRIT: A Blunt but Undeniably Progressive Tax. 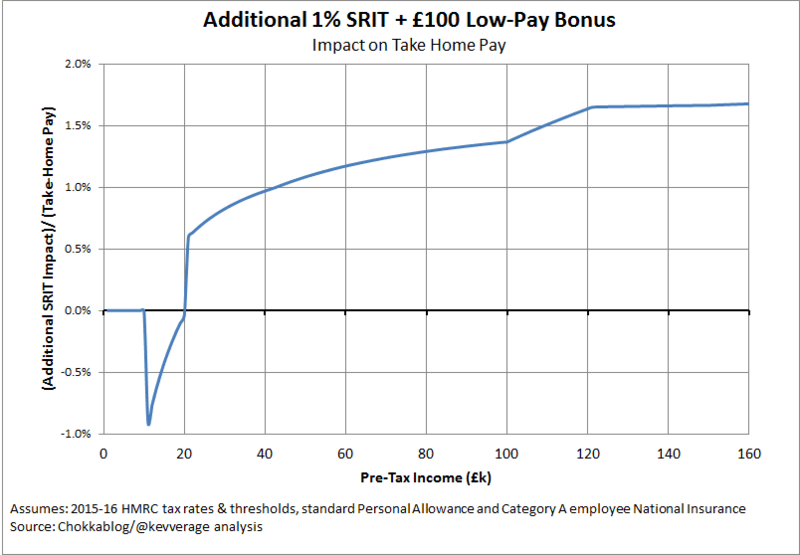 The strongest argument against using the SRIT is not that it isn't progressive (it is) but that it still has a direct negative impact on the take-home pay of the lowest earning tax payers. The obvious counter-argument to that is to simply point out that the taxes raised do not disappear into the ether; a competent government would be expected to use the funds raised to prevent cuts that would hurt the worst off (including those lower earning tax payers). The logic of this may be sound, but the indirect nature of the "avoided cuts" benefit makes it a hard sell to a low-earner seeing their take-home pay decrease even by a relatively small amount. 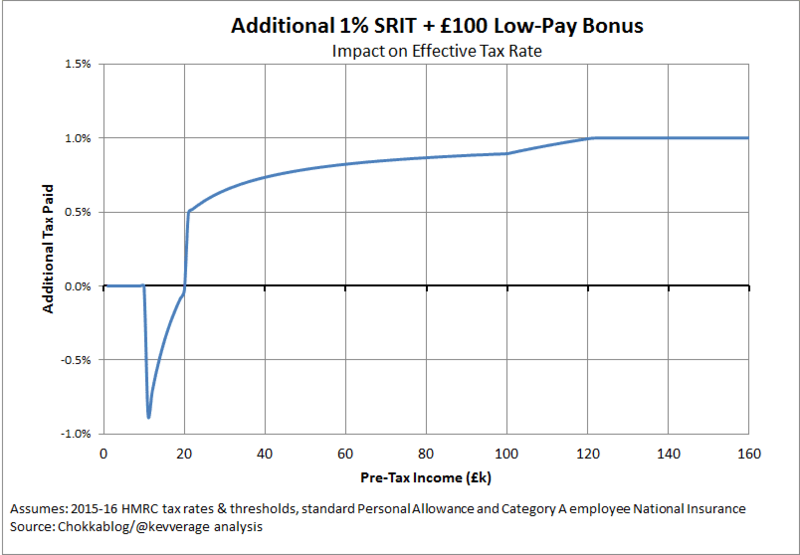 Which is where we come to today's announcement by Scottish Labour: they would add 1% to SRIT but make a direct1 £100 "refund" to lower earning tax payers to guarantee that they won't be worse off. In fact, all of those earning less than £20k would be slightly better off. There will I am sure be some devil in the detail of administration, but on the face of it it's a simple, pragmatic solution - it allows us to use the SRIT while protecting the lowest earners from any economic downside. Labour's proposal to actually use the SRIT is in stark contrast to the SNP's proposal to simply do nothing, to passively mirror Tory tax policies. In effect the SNP have thrown their hands in the air and said "if we can't do everything we aren't going to do anything" whereas Scottish Labour have rolled up their sleeves and said "right, how can we use this power to offer an alternative?". While the SNP have been focusing their considerable political muscle on stirring grievance with Westminster, the Scottish Labour Party have been thinking about how they could constructively use the powers the Scottish Parliament has, have been focusing their efforts trying to work out how to actually prevent the worst of the cuts and to spread the burden of austerity more fairly. This is a highly significant policy announcement. The proposed 1% increase in SRIT would be expected to raise £0.5bn2 - that's almost enough to completely wipe-out the £0.6bn cuts to Scottish DEL (Departmental Expenditure Limit) proposed in the draft budget for 2016/17. I have no doubt that some earning £60k pa. will feel paying an extra £10 a week to help prevent £0.5bn of public expenditure cuts is too high a price to pay for "social justice", that some on £150k will honestly believe that paying £29 a week to protect vital public services is simply too much to bear. If that's your view I guess you vote Tory. But for those who heartily denounce "Westminster austerity", for those who rallied behind the banner of "social justice" during the independence referendum? Well Scottish Labour are now offering them a real choice come May 2016, a chance to actually choose a different path on tax and spending. I wonder how many will follow their conscience and vote for the progressive option? 1. The precise mechanics of how this would work are unclear to me; the Press Release simply states "We would establish, with local authorities, a £100 annual payment to boost the income of low paid taxpayers." 2. 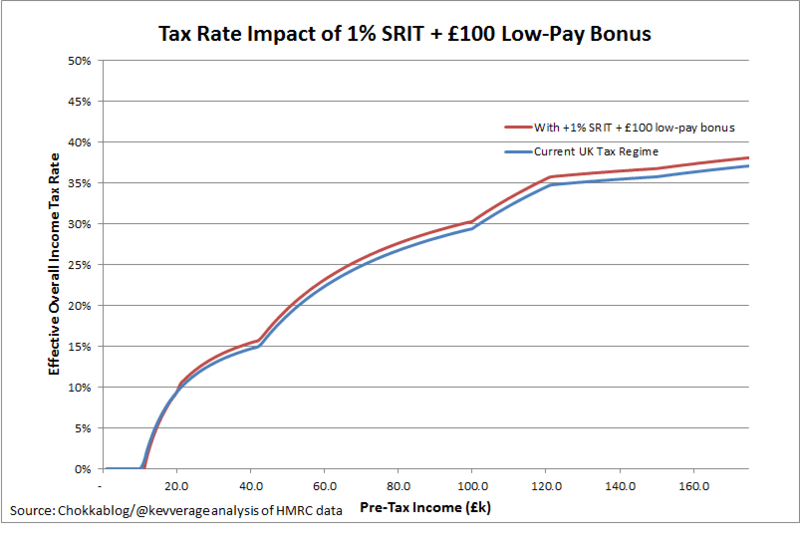 The fact that using SRIT is a progressive step is neatly illustrated by the fact that the cost of the £100 bonus to all tax payers earning less than £20k (which more than offsets the impact of the 1% increase in SRIT on those tax payers) is estimated to be just £50m.